Siddhapeeth, Shaktipeeth, Gyanpeeth and Jyotipeeth श्री योगमाया मंदिर (Shri Yogmaya Mandir) is taken care by 16th generation of same family of vatsh gotra. 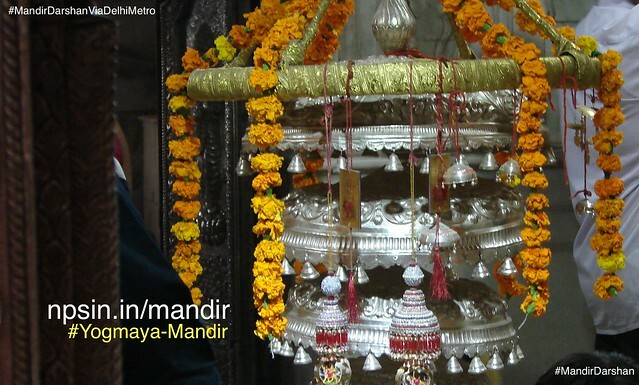 Temple is dedicated to Shri Yogmaya sister of Lord Krishna, Near by Qutub Minar. Phool Walon Ki Sair (फूल वालों की सैर) or Sair-e-Gul Faroshan (सैर-ए-गुल फ़रोशां). Combination of Siddhapeeth, Shaktipeeth, Gyanpeeth, Jyotipeeth. First Temple of Maa Yogmaya. Brahma Ji had done tapsya at Yogni Pura place. Temple area is previously called as Yogni Pura. When Lord Krishna established the Pindi, then this beej mantra was pronounced for the triune prameshwari. The remnants of the time that come out in the Khandars, there are clear indications that these Khandars will have been the palace of Prithviraj Chauhan ever. The pilgrims bathing in Anangpal pond used to do Yogamaya ji. When there was no water in that pond, difficulties were encountered for the devotees, so the well was built with the temple. during the Quit India Movement, Britishers was stopped this festival Phoolwalon Ki Sair. First Prime Minister of India revived and inaugurated this festival Phoolwalon Ki Sair in 1962 to promote Hindus-Muslims harmony.